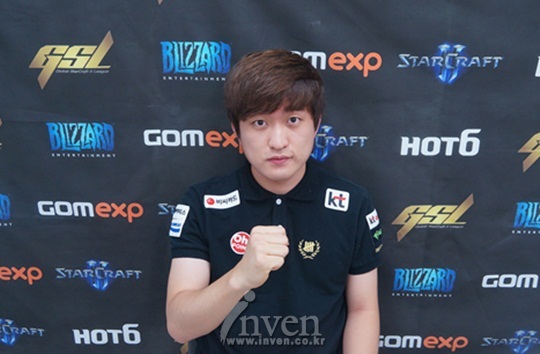 This is your first time advancing to Code S. How do you feel? I am glad that I was able to advance through. I told myself that it was going to be difficult if I faced PartinG hyung but I was able to avoid it. I got lucky. 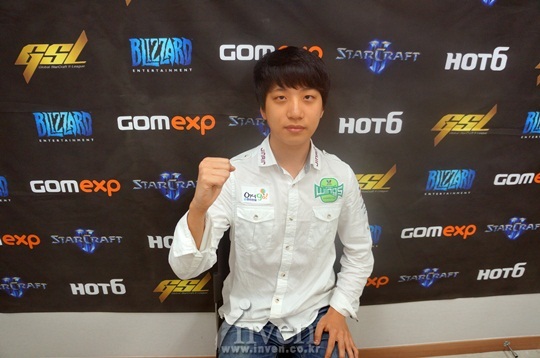 Why did you think it was going to be difficult to defeat PartinG? His strategies are diverse and daring so it is cumbersome to take them on. You advanced to Code S right after returning. What is your secret? First off, the game is really going well for me right now basics wise. I also think the key factor was that the players who faced me let their guard down. You showed a peculiar strategy against Sleep. I experimented while watching Sleep's VODs. I noticed that he always played all his games in a similar manner so I prepared responsively to that. You seem to be doing well since you advanced through with four straight victories. You might even be eligible to be sent out in the Proleague roster. What are your goals for Code S this season? I want to thank Rogue hyung and adios for helping me with practice even though we're on break right now. I also want to thank DRG hyung and other MVP hyungs for helping me plan out build orders. You've advanced to Code S eleven times in a row. How do you feel? Your performance was not good today though? Personally, I think that my skills are lacking. I've actually been thinking to myself that a lot of luck has followed me during all this time. Today's matches really solidified that for me and I realized that I have to work hard from here on out. What made you realize that your skills were lacking? I saw people post in community sites that they think that I've been pushed back from Proleague. Recently, during practices, I noticed myself that my performances are lacking. I never acknowledged this in the past but I have started facing reality these days. In your first match against Sora, you allowed a comeback to occur in game two even though you had the advantage. A good player should be able to secure his advantage when he has it. Since I wasn't able to, I feel that I am still not quite there. Were you heavily affected by the loss in match one? In the past, I wouldn't be able to regain my focus if I allowed a comeback to occur. My anti-fans seem to really enjoy seeing that side of me. I felt sorry to my fans who cheer me on so I worked hard so I would no longer show that kind of form. Also, coach Park Dae Kyung said a lot of good things to me after the match one loss so that was a really big help. It looks like you want to say something regarding the maps. Foxtrot Labs is too bright. It's bright enough to make you squint, and I even have a teammate who puts his settings to low just for that map. So I went ahead and posted about that on a networking site and the map ended up getting modified. I felt proud that my opinion was reflected upon. Also, if you close spawn on Deadwing then you're too close to each other. I think specific races fall into too big of a disadvantage during those situations so I think it'll be good to force cross spawns for that map. First off, there is a misunderstanding that I would like to clear up. After I beat Sleep hyung, I posted "you have to win like this to really feel it!" in the chat. But then the commentators went ahead and mentioned that I did that so my humanism seems to be under suspicion. (laughs) I'm really close with Sleep hyung. I was just responding to his provoking from earlier on, that's all. I am sorry that I beat Sleep hyung today. I really hope that the next time we meet will be in Code S. Also, coach Park Dae Kyung's advice really helped me out big time. I will treat him to something delicious if I get the time. You've advanced to Code S thirteen season in a row. How do you feel? Even though my Code A matches were right in front of me, I developed air-conditioningitis along with an acute gastroenteritis so I wasn't able to prepare a lot. So I practiced mostly through image training and I think that ended up working out well thankfully. For the winners' match, you played a style that consisted mostly of queens. Weren't you worried since Avenge did the exact same strategy during the afternoon matches? I taught Avenge that strategy because I wanted him to use it. I had no problems since I already knew what I was going to do after that play. There seems to be a lot of controversy behind the new maps that were announced for Season 3. What do you think about them? On Deadwing, close spawns are gigantic issues. You're so close to each other that from a Zerg's perspective, it's difficult for us regardless of what race we are facing. I feel that the other maps also were made to cater to Terrans. The DRG momentum from the old days is not coming out. Why do you think this is so? I do really well during practices. But for some strange reason, my performances are not good for televised matches. The stress was bad because I wasn't producing results and I keep on getting older. But I was able to realize something while enduring the pain recently. This pain that I was feeling made me realize that the stress that I would feel from not producing results and having to go to the army was nothing. (laughs) I want to play while having fun from here on out. How the fans cheered you on today was quite amazing. I think it was because they hadn't seen me in a while since Proleague ended. I feel proud because it feels like I was able to fulfill the fans' expectations with good games. I am grateful for them cheering me on. You successfully advanced to Code S. How do you feel? I am glad that I was able to advance through. But I think I was bound to move on since I was in a rather easy group. But I plan on not getting conceited form here on out and work hard. You took down Panic twice. What was your secret? I knew very well that Panic was an aggressive player. That was the key. 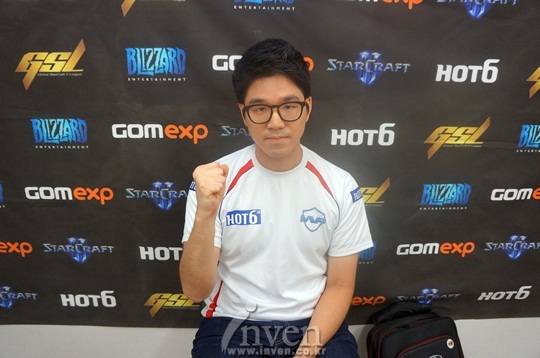 You lost to DRG twice in the winners' match to the same unit composition. How come? Nothing worked out in game one because I felt like something was wrong from the very get go. For game two, DRG made a lot of queens so I lost my warp prism that I sent for aggression purposes. From there on, the game tilted in his favor. You were eliminated from the Ro32 of Code S two seasons in a row. This is the last season for this year so you must be preparing for it more so than before. I was only confident in PvT for the past two seasons. Since I had no confidence in my other matchups, I improved my skills. I'm still lacking a bit in PvZ but I plan on refining that using my break this season. Anything else you would like to say?? I want to thank the people who cheered me on. I always say that I'm going to do well but I was embarrassed since I kept getting eliminated in the Ro32. But for this season, I will become a player who is a contender for the championship. You've returned to Code S. How do you feel? I was really disappointed last season because I was eliminated too quickly. I am satisfied that I was able to return quickly though. It made me very uneasy. (laughs) I even though to myself that I would forever be stuck in PC bangs at this rate. So I practiced even more and I approached the qualifiers in a confident state. 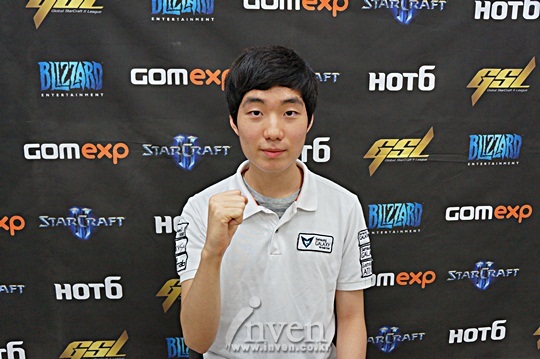 After winning a GSL championship, you declined rather rapidly afterwards. How come? It's because I decreased the amount of practice that I was doing after I won. And then mirror matches became cumbersome because the oracle patch came through also. Since I started stumbling in mirror matchups, that started influencing all my other matchups. Overall, the balance just fell. Have you adapted to the patch now? I practiced a whole lot so that I could adapt to the patch. In my current state, I have completed the adapting process. Overall, you secured mostly comeback victories today. You were especially in a dangerous situation during the winners' match because of Dark's lings. I've faced Dark before on ladder. I thought that I had deciphered his skills somewhat but I unexpectedly got flustered at his ling attacks. But if you really take a look at the situation, I wasn't really in that much of a disadvantage. You are currently teamless. Wasn't it difficult to prepare for your matches? There is a team that I am currently in talks with. But for now, I practice mainly through ladder. Of course it is the championship. My goal is to make it to BlizzCon so I will win the championship no matter what. Even though I was in a slump for quite a while, a lot of my fans continued to cheer me on. I want to let them know that I am grateful for that and that I will work hard so that I can make sure that I pay them back with results. You've successfully advanced through to Code S. How do you feel? Which match was the most difficult? The final match against Billowy was difficult. The victories were quick so I just kept getting nervous. You showed an aggressive style today. What is your style normally? I prepared an aggressive style specially for today's matches. I experimented with my opponents' styles in mind. Your recent performances have been impressive. What is your win/loss ratio for inhouse rankings? It's not bad. My win percentage has been going up lately and I win over half my games. (laughs). Little by little you have been producing results. What are your goals for this season? My goal is the quarter-finals. I plan on advancing bit by bit as I take my time. You have Proleague post-season ahead of you. Do you think there's a chance that you'll get sent out? If I get the opportunity then I would like to get sent out. I am confident. I failed at maintaining my body condition because I prepared too hard for today's matches. I will do a perfect preparation for the Ro32 so that I can show a better performance. Also, I want to thank my fans for always cheering me on. How do you feel about advancing to Code S? I was really nervous since I knew that I would end up in the PC bang qualifiers if I lost. I had no confidence since I couldn't practice a lot. But I think I was able to win because I had a lot of televised matches experiences. Your performances today were good. If you had to evaluate your own skills? In my opinion, my match against Cure was a flawless performance. (laughs) In my second game against Impact, I would have won with ease had I just played it slowly after taking down his expansion but I was too impatient. I kind of didn't like that part. You pulled all your probes so that you could block Impact's early game roach attack. Was that necessary? I didn't care since I knew that I would win just as long as I blocked it. I decided that all I had to do was accomplish that defense. SKT players are all doing really well in individual leagues so there is a good chance that you will have to face them for this season as well. Are you confident if a team kill occurs? I don't lose in friendly matches. I do have confidence but I would like to avoid them if possible. I know that it's inevitable that feelings will get hurt. I really hope that a group selection ceremony will occur this season. 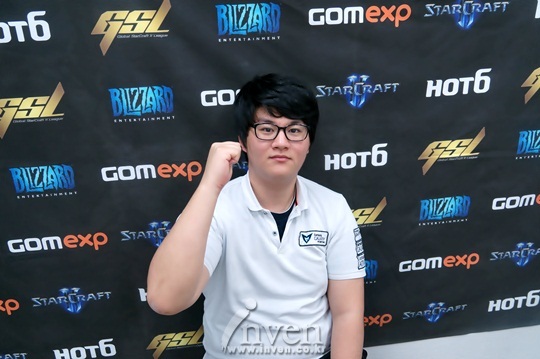 You have no GSL championships yet. What are your goals for this season? In my opinion, I always feel that I am capable of winning the championship. Not to mention that my skills have no problems. (laughs) But winning the championship is only possible if luck follows through as well so I think I'll be able to win just as long as a little luck follows through for me. 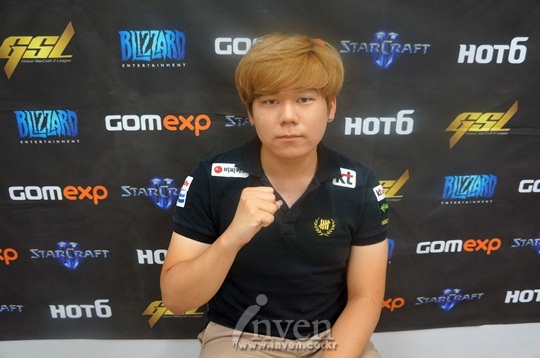 Recently, you lost to Jin Air in the Proleague playoffs. That must have largely affected you. While it's true that we placed second, we are first in the overall rankings so it's not really that big of a deal. Same goes for my teammates. You tend to get weak when you head into the post-season. Why do you think this is so? Honestly, back in the BW days, I was really good. I don't really know if there was any specific reason for my poor performances. If I had to pick one then I'd say that I probably get tired since the post-season takes place after everything else has finished. But I will win no matter what for my next match. 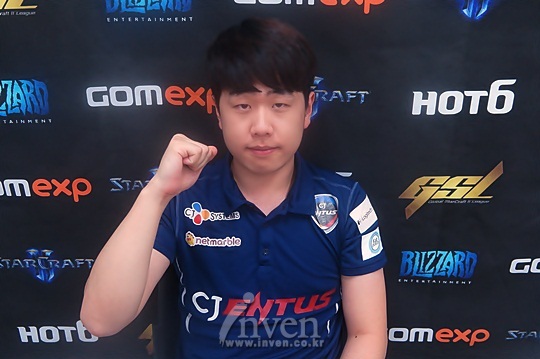 You will face CJ Entus in three days for Proleague. What do you think of CJ? Personally, I think that CJ is an excellent team. But I feel that my teammates actually welcome facing CJ Entus. I guess it's because we're winning in the head to head score. You advanced to Code S for the first time. How do you feel? Most of my teammates are in Code S right now. I always felt that I was behind them so I am relieved that I was able to advance through. Your Jin Air teammates are currently standing out in individual leagues. How did that make you feel? I didn't want to fall behind them. I tend to get really nervous for individual league matches. But now I've racked up a lot of experiences and I think I can do well. You secured your victory against Hydra with a definitive decision. What do you think? I think that Hydra has really good basics. But I knew that he had a distinctive aggressive style so I had already done image training in advance for that. You lost your match against Rain. Why do you think so? I started off economically early on so I figured that I would win as long as I played aggressively from there on out. But I got flustered because Rain defended so well. And I think I lost game two easily because I allowed myself to get intimidated. If you had lost in the final match then you would have had to play in the qualifiers again. Weren't you nervous after losing in the winners' match? In your match against Impact, your base got contained but you pulled off a comeback. Why do you think you were able to win? I had no time to think. I think I was able to win because I just played really hard with the thought that I had to win. You stated in your televised interview that the championship was your goal. Do you think that will be possible? I do feel that it may be too soon since I just made it into Code S. But I will have the mindset that the real beginning for me is from here on out. The dominant notion is that Terran has been in a very difficult state recently. Are things difficult as a Terran? Regardless of what race they play, I think all players are excellent. In my opinion, you really can't do anything other than to just work hard. My teammates worked really hard to help me with practice. I want to thank my teammates and Pigbaby hyung. I will work hard so that I can show an even better performance for Code S.
I was always disappointed since I would always get eliminated in individual leagues. I am glad that I was able to advance through. even though it was difficult to get here, I want to advance to a high place since I was finally able to grab this opportunity. Your first time participating in Code S ever since HotS came out. Why do you think that you've been stuck in Code A all this time? For last season, my preparation was insufficient. 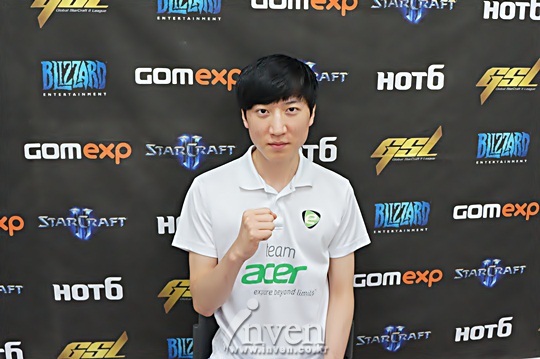 I just didn't have the time since I was preparing for GSL at the same time that I was preparing for Proleague. But this time around, I had plenty of time to practice since I was able to go on break. Your first opponent was Shine. Was there anything you specially prepared for him? I decided on a concept of harassing him early on before Shine hyung could do anything. I think that decision worked out well. Your distinctive aggressive style has not been working out well as of late. Any thoughts behind changing things up? Honestly, I've been preparing various things. In Flash's case, he is really good at defensive plays. Since I can witness all kinds of things like that, I am currently experimenting with various styles. 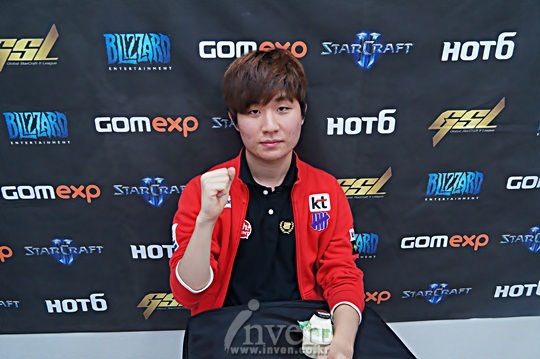 In the winners' match you met ByuL, whose momentum was really good. Wasn't that burdensome? I am well aware of the fact that ByuL is a good player. But I am someone who is always confident and I always feel that I can defeat anyone. It was a difficult journey to get to Code S. What are your goals for this season? I want to thank my teammates for helping me with practice. KT Rolster will face Jin Air Green WIngs for the post-season playoffs for Proleague. In my opinion, our team's strategy is powerful so I feel that we will be able to win no matter what just as long as the fans cheer us on. So I am hoping we will receive a lot of support. I was feeling uneasy since I lost the first match. But the rest of my matches went well so I am relieved. Were you confident about your group? I had confident in my ZvT but not in my ZvZ. I needed a lot of practice for ZvZ but I wasn't able to do it since we're on break right now. Is that why you went for early game plays against ByuL? In Code A, the loser of the first map picks the next. Since ByuL chose to play on map with long rush distances, I read his mind that he wanted to play economically. So I went for an impromptu early game play. As of now, your personal best record is the Ro16 of Code S. What are your goals for this season? I always felt confident but the results never came. I will work even harder this time around and advance past the Ro16 no matter what. During your televised interview after your matches, you stated something about food. What was it? It looks like Samsung is currently on break. That's correct. But even though we're on break, excluding a few players, we're mostly all still at the team house. It feels like we're all free practicing. Recently, our team has not been doing well in both Proleague and individual leagues. So coach Joo Young Dal was really worried about that so I think he'll be relieved since at least I was able to make it through. I am going to use my break to go back home. I want to hurry up and see my parents. I am glad. Ever since the qualifiers I approached my matches with the mindset that I would make it through for sure. I will work hard with the thought that from here on out, this is the beginning. Were you confident after finding out about your group? I don't think that what group you're in is that important. I think that I can beat anyone as long as I prepare properly, and I was feeling confident because I practiced a lot for these upcoming matches. You played all three games against Symbol. Were there any critical situations? I don't think there were any serious critical situations. But I am really disappointed about game two. I even knew that Symbol liked to use roaches so I prepared for it but it still ended up being disappointing. You got hit by Symbol's roach/bling attack. You stated that you prepared in advance for it since you knew his style? The problem was that I didn't scan even once even though I should have. Symbol really came with optimization. It looked like you were in a dangerous situation for a minute there in your match against Hush when he went for blink stalkers. I thought to myself that I could still block it even if my bunker line did get penetrated. In fact, I actually told myself that it was good for me that he decided to go for a blink strategy. 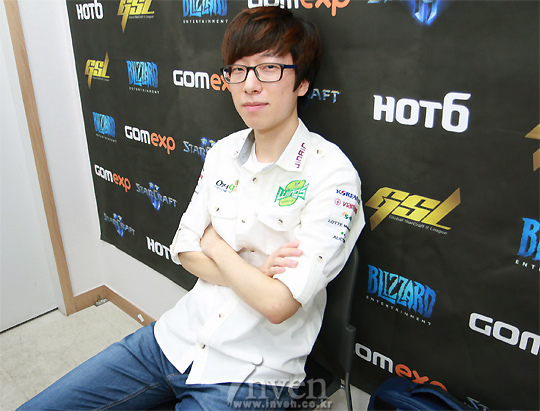 You've returned to Code S after three seasons. What are your goals for this season? First off, securing my seed for next season is my goal. After I've accomplished that goal, then I will take my time and think about my next goals. You have Proleague next week. How are the preparations coming along? The current atmosphere is good. I didn't do so well during the final stages of Round 4 but I think I did a good job making up for it. In my opinion, our team is powerful but I won't know for sure until we play. But I feel that we can win since we have a lot of post-season experiences. Also, I would like to face Maru. As of right now, the water level has risen for my TvT so I feel like I can win against anyone regardless of who I face. I am grateful to the fans for always cheering me on. As of right now, I am focusing on Proleague. It's because the fruits of all my effort for this past year are right in front of me. I'm hoping the fans will come find the finals location and cheer for us. How do you feel about advancing to Code S for the first time? I think it's taken too long to get here. But I feel really good. You got here difficultly through the final match. Which match was the most difficult? Excluding my match against Flash, it wasn't difficult since I told myself that I could win them all. The only thing I'm disappointed about is the match against Flash. During game two against Flash, you started targeting his bunker and then you stopped. I was thinking to myself that I was going to be able to break through no matter what. You are a royal roader candidate. What are your goals for this season? You have a good record in Proleague currently. What is your secret? You will face Rain in the post-season matchup for Proleague. Are you confident? Personally, I feel that Rain is an excellent player. He's known as a player with a solid style but I will work hard so that I can kill that solidarity. I am disappointed that my performance against Flash was not good. I want to get revenge if I get a chance to next time. Honestly, when I was provoking Flash during my televised interview after the match, I was just trying to get some laughs. (laughs) We have our post-season Proleague match ahead of us. I hope that our team will be srtong so that we can win the championship together. Also, I want to thank everyone for always cheering me on. You’ve returned to Code S. How do you feel? I was worried a lot today. But I feel lighter inside since I was able to advance easier than expected. I am glad. You showed us a lot of SCV pull timing attacks in today’s matches. How come? I was inspired after watching Flash play. I experimented with builds and prepared optimal timing attacks. I thought to myself that my opponents couldn’t block my attacks even if they knew about them. Did you feel any pressure regarding having to undergo TvP late game scenarios? That wasn’t it at all. I am confident in TvP late game scenarios. It just wasn’t the concept that I had prepared for today’s matches. You looked like you were having fun with widow mine plays. You must be more glad than anyone about the widow mine buff. When I’m doing well in TvZ, I have a lot of fun with widow mines. I think TvZ just got one step easier with the widow mine buff. I’m excited for this season. 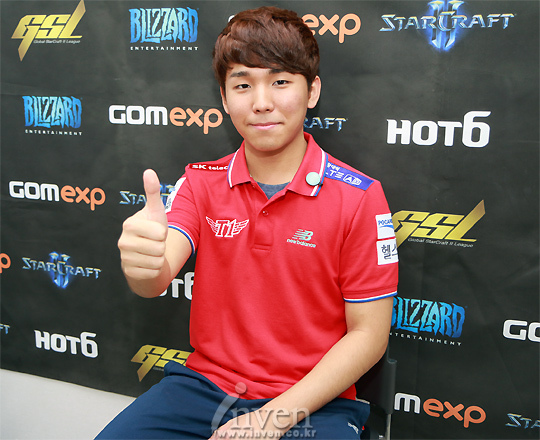 There are more Terrans competing in Code S this season. Do you think we’ll get to see Terrans perform this time around? 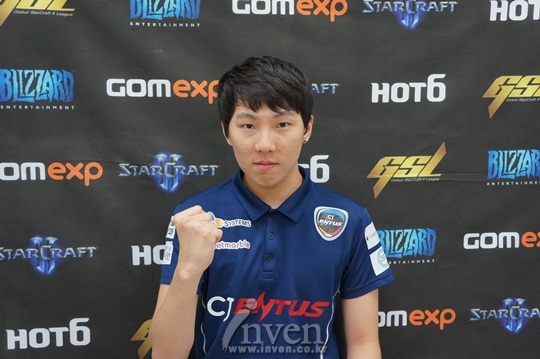 With the widow mine buff, I believe that all Terran players who somewhat have skills will be able to do well. If we can do well in TvP then I see becoming the top race as also a possibility. It’s difficult to see your face since you don’t even come out for Proleague. How have you been? My time is spent practicing at home. I attend overseas tournaments whenever they are available as I spend my time freely. Your performances as of late have not been as good as your past performances. How come? I also get this disappointed feeling whenever I get eliminated from a tournament. I feel that I lack in preparation and practice. Is it difficult to practice since you’re on an overseas team? That’s not it. I feel that my passion is the most important thing. It’s because I was lacking. I was really disappointed in myself after I got eliminated from the Ro16 last season. So my goal for this season is to make it to at least the quarter-finals. I want to thank my fans for always cheering me on. I will work hard. You advanced to Code S. How do you feel? What did you think when you found out about your group? Were you confident? When I saw INnoVation’s name on there, I got both frustrated and excited. 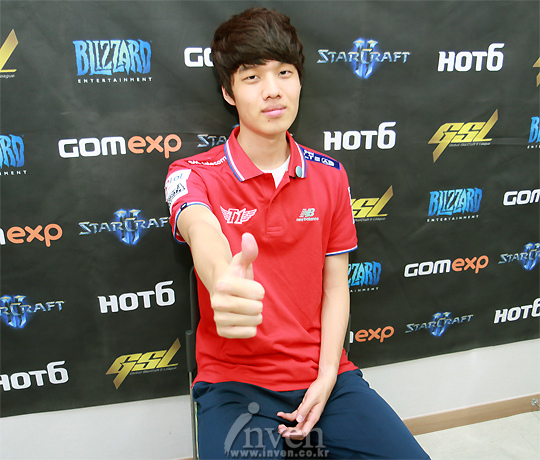 I think it’s because I had confidence in my PvT even though I knew that I was scared of INnoVation. Excluding INnoVation, overall it felt like I could handle it. You stated in your televised interview today that you weren’t able to predict INnoVation’s timing attacks. So then what did you anticipate? I’ve faced INnoVation many times on ladder. I expected him to play macro games so he caught me off guard. Samsung is famous for feeding its players well. Are you satisfied? I never get sick of the menu because it always varies. It’s more delicious than going out to eat. What is the best thing about joining Samsung? I like that I can talk to the players a lot. The team house is also located in a residential complex so there are a lot of places to shop downstairs. There’s even a health center on the ninth floor. I even like my bed (laughs). We saw you take your hands off after game one of the final match. Were you really nervous? I got nervous a lot since it was game one of the final match. I tend to get nervous a lot whenever I’m winning so I think that’s something that I have to fix. We know that Samsung is on break right now. It’s it difficult to practice? I experimented while watching VODs and practiced mainly through ladder. We still have some players at the team house even though we’re on break so I was able to practice. During your Code A qualifiers interview, you stated that you were going to advance into Code S no matter what. You kept your word so you must be proud. I’ve had a lot of instances where I’ll say I’ll make it and then end up failing. (laughs) So I’m going to work harder than ever before for this season. I want to thank my parents and my friends for cheering me on. I also want to thank coach Joo Young Dal for coming with me today. I hope the rest of my teammates will do well for their matches. You’ve advanced into Code S for the first time. How do you feel? I feel really good. It’s difficult to properly express it. Did you anticipate you’d advance through today? Your group looked really difficult. Personally, I have the most confidence in my PvZ. I was thinking of a scenario where I advance through after facing two Zergs and then things happened that way exactly. You attempted to end all your games against Leenock quickly. Was there a reason? I know that Leenock has a style where he likes to gather a lot of resources and then spend them all at once. So I aimed to target him before that timing could hit and it worked that way properly. EffOrt persistently tried to do a hatchery rush against you. Did that affect you? I had a build prepared. But I wasn’t able to use it because EffOrt persistently kept attempting hatchery rushes against me. But I think it ended up working out well because I was able to save my build for another time. Overall, you seemed very aggressive today. Is that your style? I like undergoing engagements. I approached my matches today after changing up my style. I think it worked out well. Your play style is really tough. Any connections with your ID? For a long time there were no results from you that even retirement was a possibility. You must want to say something about that. All this time my parents and the coaches have been worried about me. I am relieved that I was able to make it through this time and I think I was able to give back to my friends for cheering me on so I’m relieved. Since it was difficult for you to get here, you must have a lot of anticipations. What are your goals this season? First off, I want to experience the group selection ceremony. After that, I’ll aim for the championship (laughs). Soon our team will be facing KT in the post-season semis for Proleague. I hope that our team wins no matter what and that we get to show a good form for the finals. You advanced into Code S. How do you feel? It’s been a while since I’ve made it. It would have been an easier road for me if I had won in the winners’ round but I wasn’t able to so I’m disappointed. You had really difficult matches. Which match was the most difficult? 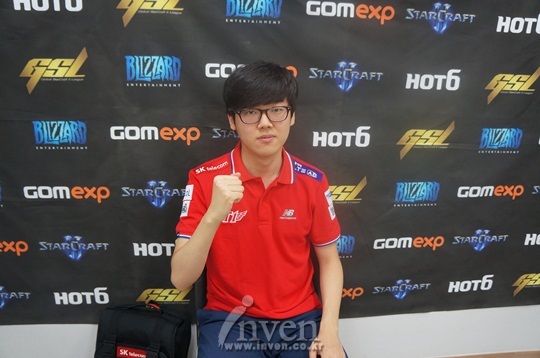 My match against Terminator was the longest but my match against SuperNova was the most cumbersome. Overall, the new maps are not good for Zerg. You attempted hatchery rushes for every game against Terminator. How come? I just wanted to make him flustered. But after I did it, I realized that I didn’t have enough money to do what I wanted to do so things got twisted up. In the winners’ match, you allowed a comeback to occur even though you had the advantage. What was the problem? First off, the issue had to do with me. 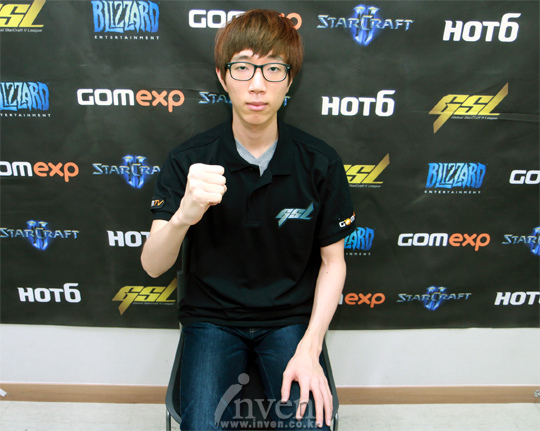 After that, it’s because Protoss is too strong (laughs). You showed superior ZvZ plays for the final match. Are you confident in your ZvZ? Recently, my ZvZ skills have been rising. The game has been going well for me these days so I also found confidence. Several days ago, CJ lost in the post-season. How is the atmosphere? Don’t ask (laughs). We’re all on break right now. I’m just here because I had my matches today. It’s been a while since you’ve made it. What are your goals this season? The ultimate goal is the championship. But for now, I want to make it to the quarter-finals first and then grab my next goals. I want to let everyone know how hard the coaches and my teammates have been working. I am also grateful to the CJ organization for not being too reserved with their fund for us. Above all else, we were able to be so strong because the fans cheered us on. I am going to do well from here on out so I am hoping I will receive a lot of support. DongRaeGu's interview is now up! MyuNgSiK's interview is now up! Also, I had never heard of air-conditioningitis before. Seems to be a primarily Korean thing, no? 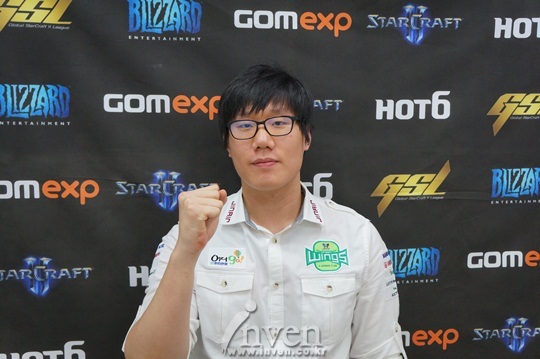 Parting seems to be eating some humble pie as well. I hope he can buckle down and improve because he is such an entertainer it would be disappointing for him to be knocked out of Code S early. They have knocked him out of every single season of WCS since it began with HotS. He's probably equal or better than most of the other top-tier toss players that have won major titles that he lacks, but two particular zerg players won't stop killing his dreams. They're his teammates too, which has gotta be a little awkward. Thank you for translation, Seeker! Dear's interview is now up! Oooh, nice to see that Dear might not be teamless for too much longer. He would be a great addition to so many teams, i hope his discussions go well. Hopefully he can make a good Code S run to help his cause. The rumour is he's on Samsung but they're waiting til after Proleague to announce it. Glad to see Dear back to where he belongs. I want to see an on form Dear vs an on form Zest.